You Know George of the Jungle....I don't the NoBrain 2012 is actually a jerk. I think its a problem with a lack of brains. Not sure we will ever see someone as clueless as this person. They hate Obama because he's smart and long for the days stupidity would return to the white house. Stupid attracts stupid don't ya know. November you really are a jerk. All presidents and all white houses host the winners of sporting events. Tell us all about your great repo candidates why don't ya. You are real good at bashing so tell us how good your guys are. Tim Thomas, you are an arrogant little man. You put your personal politics above the team. If my kid had a Thomas sweater I would burn it. For shame! Heres another example of nobama wasting my tax money feeding on parties when theres people not making enough money to put food on their tables, if they could afford those tables. Hey nobama, give some of my tax money to those that need a helping hand instead of wasting i on parties! Hate to wreck your arrogant world of self importance, but 54% of the electorate voted for Obama, that would be about 100,000,000 people. So, I don't think the little amount you pay in taxes in comparison gives you the right to decide for the rest of us. 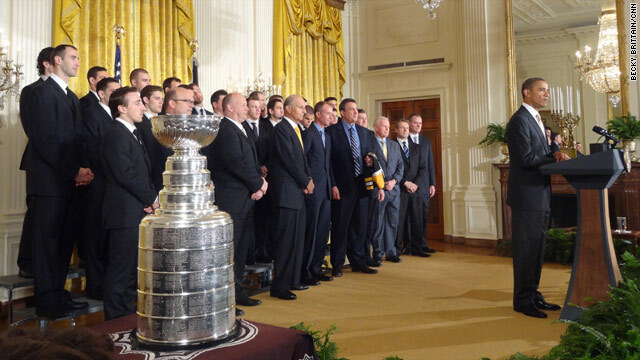 Besides, the teams that win championships call the White House to set these things up. Why don't you call the team owners and complain to them, so they can ignore your moronic complaints like the rest of us.